The lunar eclipse here along the New Jersey shore last night was stunning – but so was the windy and frigid weather following a dramatic arctic cold front, …making my camera and my fingers frozen. Above: Just prior to the eclipse, a maximum full moon. After I admitted defeat with the cameras, I went back outside with just my heavy gloves and binoculars, where the fully eclipsed moon, high above, was awesome, beautifully colorful and surrounded by the winter stars. As the earth’s shadow is cast upon the lunar surface, its temperature drops hundreds of degrees. Here at our house, it seemed the temperature dropped just as much, from 50 degrees (F) at about noon yesterday to 7 (F) degrees this morning, with a wind chill of at least -11 degrees as shown below at 7:21 AM. 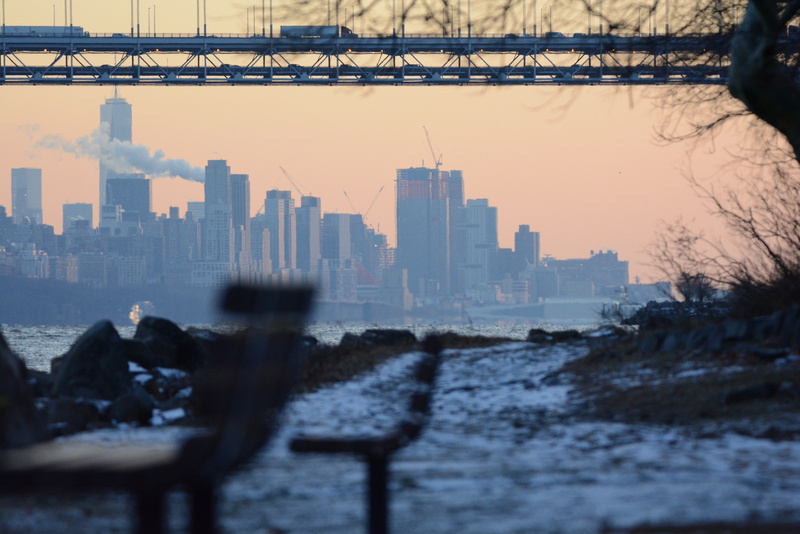 Two images captured of the New York skyline were featured on my previous post. 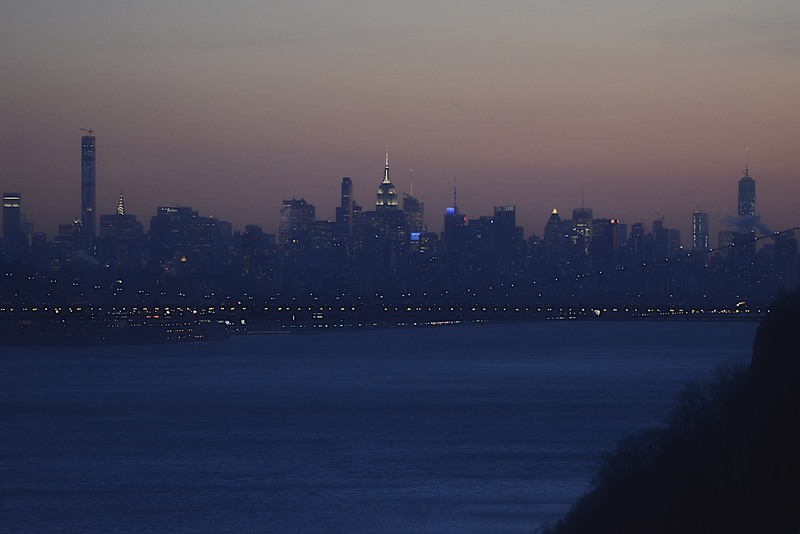 To change perspective, I drove closer to the George Washington Bridge, now 1/2 mile (.8 km) south, for this view from the edge of the Hudson River as twilight was approaching. To keep from dying (the wickedly cold wind chill was brutal,) I was now shooting from my car, with the telephoto extending out the window for support. Since I thought no one else was in the area, I had driven off the road to a snow covered grassy area near the water. Busily shooting away, I didn’t notice the Palisades Interstate Park Police cruiser, headlights on, approaching slowly from the road. It was now well after sunset, and the park was officially closed – a fact that had escaped me. For several reasons I was grateful for their leniency and appropriate scrutiny followed by a cordially-offered wave of approval. 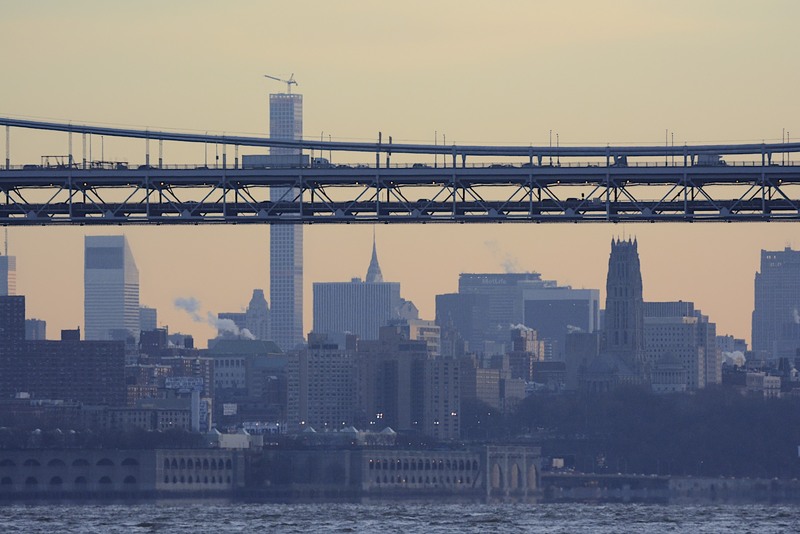 I’m sure the barrel of my lens pointed at the GWB could have been likened to something a little more threatening. Giving me a few more minutes as the skyline grew increasingly more impressive, they eventully escorted me up to the top of the switchbacks where I drove to the Rockefeller Lookout, 2.3 miles further north and 400 feet (122 m) higher, on top of the cliffs. ABOVE: The GW bridge cable and roadway lights are now visible in the lower part of this image, as seen from on top of the Palisades. 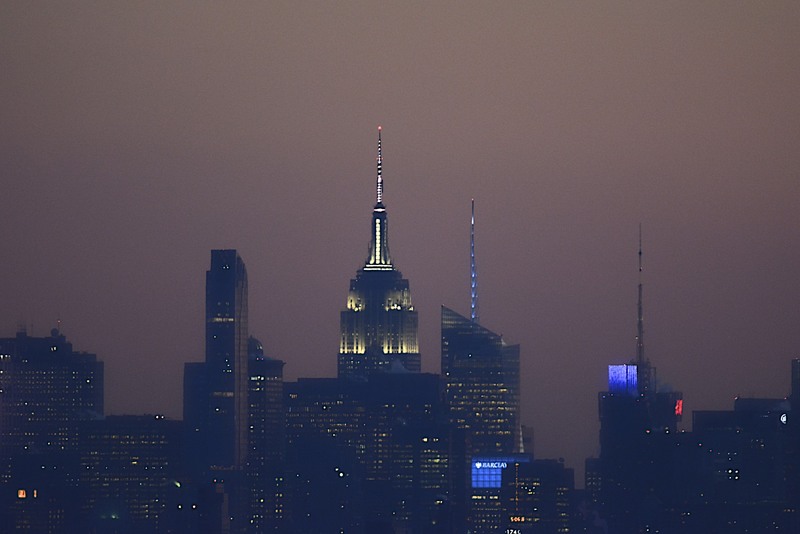 731 Lexington, 9.0 mi (14.5 km) from lookout, 806′ (246 m); 1985, is lit on top. Trump World Tower, 9.8 mi. (15.7 km); 861′ (262 m); 2001, at far left. 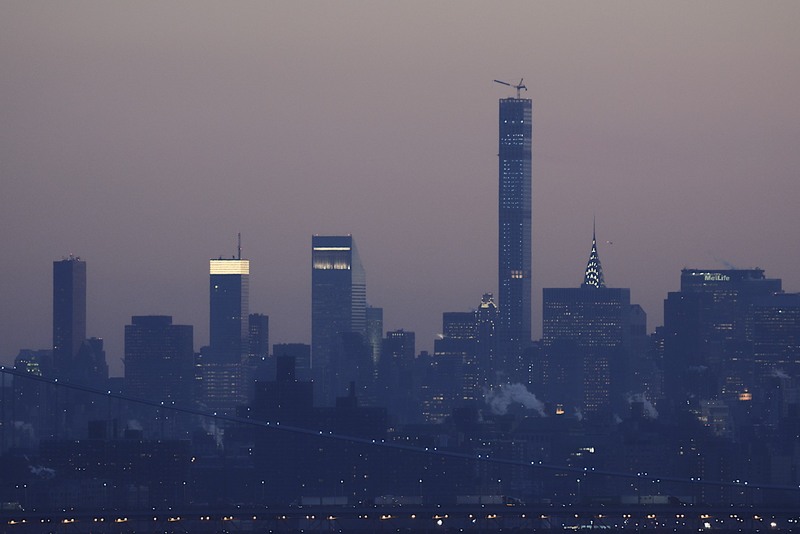 One World Trade Center -Freedom Tower, seen at the far right., 13.1 miles (21 km) from the Rockefeller Lookout, standing 1776 feet high (541 m), and listed as a 2014 completion. Click or stretch images to see at wonderfully higher resolution. Located aside the Hudson River, the Englewood Boat Basin is on the New Jersey side, a few miles north of the George Washington Bridge. 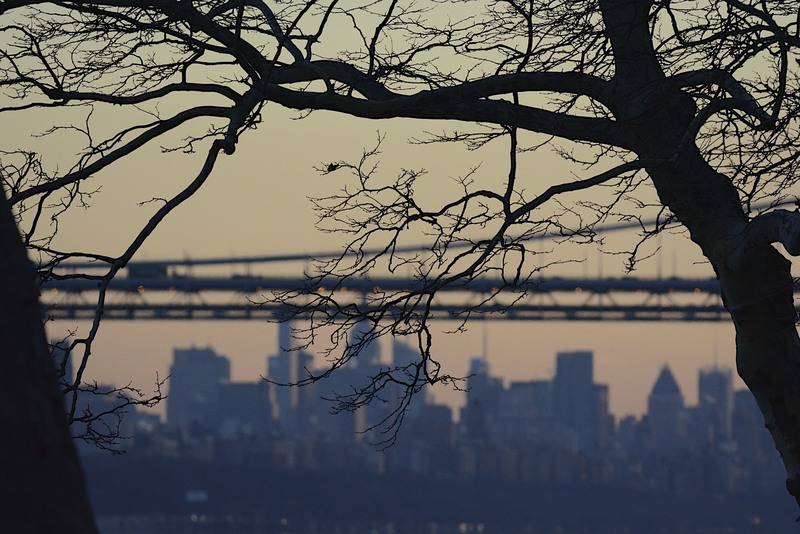 just “cold as bones” trees silhouetted before the bridge, and Manhattan beyond. More images shortly, as twilight and park police crept forth. Thanks for visiting, and as usual comments are always welcome.